One of the guests receiving their Welcome Kit at the Shell Hillstand. At the podium to congratulate the winners of the Shell Malaysia Motorcycle Grand Prix 2018 are (from right to left), Minister of Economic Affairs, YB Dato' Seri Mohamed Azmin bin Ali, Dato' Menteri Besar Selangor, YAB Tuan Amirudin bin Shari, Chairman of Sepang International Circuit, YBhg Tan Sri Mohamed Azman bin Yahya, and Chairman of Shell Malaysia, Datuk Iain Lo. Shell Malaysia elevated this year’s Malaysia Motorcycle Grand Prix (MotoGP™) experience by introducing a sensory feast at the Shell Hillstand, in celebration of its title sponsorship for 2018. This year’s SHELL MOTOGP™ welcomed over 103, 000 fans who witnessed the world-class motorsports event.The exclusive Shell Hillstand was a vantage point for the adrenaline-packed action at Turn 13 and 14 of the race at the Sepang International Circuit (SIC), with a live feed broadcast of the race on two large LED screens. Fans had clear views of the track thus further immersing them into the action. Guests enjoying freshly baked pastries from deli2go at the Shell Hillstand. 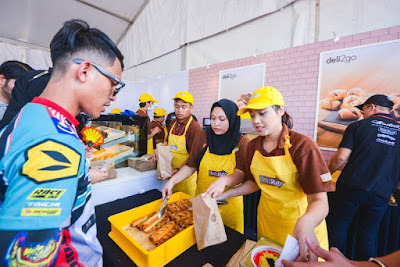 Visitors at the Shell Hillstand were welcomed with a display Ducati bikes at the entrance and had access to a wide selection of food and beverages, available from the food trucks at the venue, Shell’s very own deli2go, Costa Coffee, and TeaLive. In addition, the Hillstand included a variety of fun games and activities such as the MotoGP™ PS4™ Challenge that offered fans a virtual race track experience and the ‘Super Sepak’ activity, a soccer challenge. A Shell Reflex Challenge activity tested participants’ reflexes and their foot-eye co-ordination respectively. 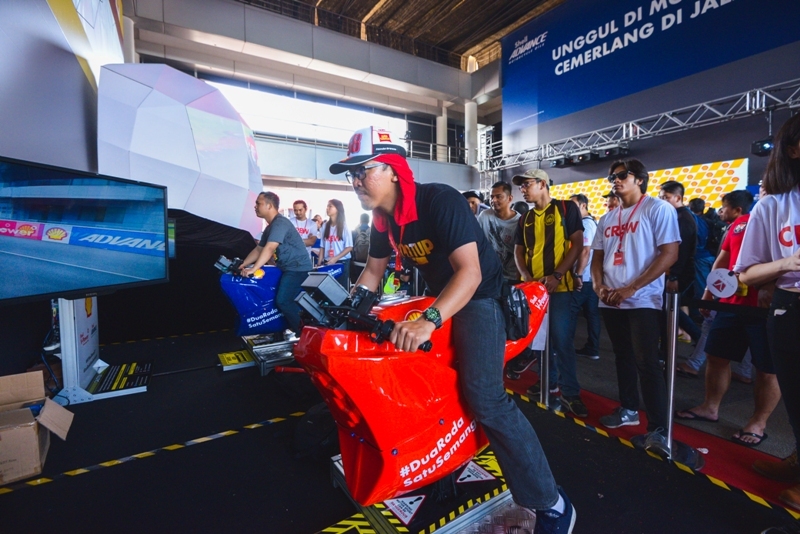 The venue also showcased the Ducati Panigale™ Dyno that provided an opportunity for eligible riders to experience the powerful machine at a standstill. Visitors trying out the bike simulators at the Welcome Centre. At the Welcome Centre, guests were welcomed with bike simulators, educational panels, and a 360° video projection on a giant motorbike helmet made from 100% recycled paper. Additionally, bikers had the opportunity to purchase the Shell Biker Value Pack during the race weekend which provided them eligibility to win a motorcycle on a weekly basis till 30th November 2018. 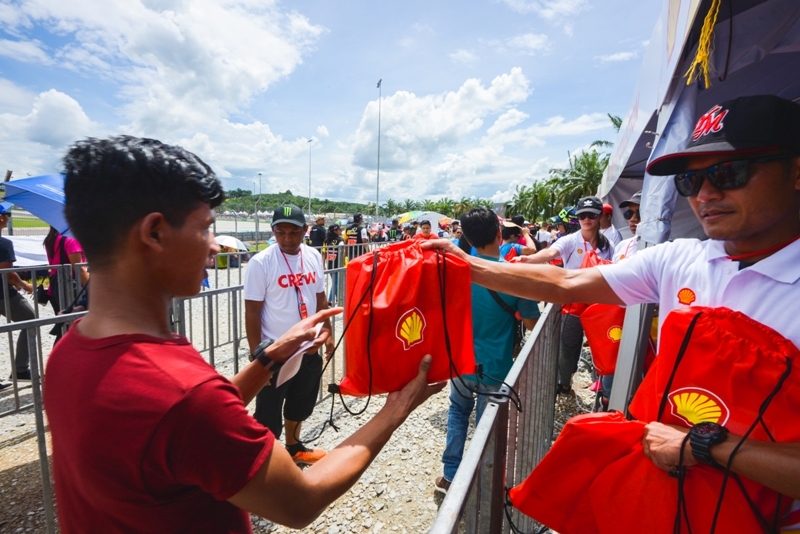 For the first time in the history of the Malaysian Motorcycle Grand Prix, Shell unveiled its mobile fuel dispenser which enabled visitors to fuel up with Shell V-Power Racing right outside the race tracks. For the first time in the history of Malaysia MotoGP™, Shell unveiled its mobile fuel dispenser which enabled visitors to fuel up with Shell V-Power Racing right outside the race tracks. To complete the bikes’ engine performance and protection care, a Shell Advance Ride Thru service was available at the carpark; complimentary with every purchase of Shell Advance lubricant during the race weekend. “Shell is committed to motorsports development in Malaysia, as evidenced by our title sponsorship for the Shell Malaysia Motorcycle Grand Prix. This year, our Shell Hillstand was designed to offer motorsports enthusiasts a unique experience with activities that incited their five senses. Our success here encourages us to continuously innovate our offerings with the hope of elevating the race experience,” shared Datuk Iain Lo, Chairman of Shell Malaysia. Shell has been the Malaysian MotoGP’s title sponsor in nine (9) of the past ten (10) seasons, since 2009, and has shared a rewarding partnership with Ducati since 1999. Shell supported Ducati Corse in the World Superbike Championship and the MotoGP™ World Championship. With over 150 race wins, this is one of the strongest and most successful collaboration in the world of premier motorcycle racing. #ShellSelamatSampai(#SSS) is a Shell Malaysia social investment programme that comprehensively drives road safety awareness and behavioral change among motorcyclists and youth, who contribute to the highest fatality rate in road crashes in Malaysia. The School Outreach programme, a key component of the #SSS enables Shell Malaysia to attempt to drive home its ‘Goal Zero’ accident-free zone message through a fun, educational and interactive roadshow to 20 schools in the country.